Spray foam insulation has become very popular among insulation contractors, and it’s easy to understand why. The two-part spray foam that contractors use most frequently is applied as a liquid. But it instantly turns into an expanding foam that sticks to all surfaces, seals air leaks and fills gaps, even in odd-shaped spaces. You get high insulation value and very effective air-sealing in a single step. Ironically, the powerful expansion that makes spray foam ideal for many insulating applications is a deal-breaker when it comes to insulating wall cavities and other fully enclosed spaces. Insulation contractors learned the hard way that spraying expanding foam into enclosed stud bays can cause the interior wallboard to bow and even pull away from studs. In other applications, the expanding foam pushed sheathing and exterior siding out of place. The quest for a foam insulation suitable for use in wall cavities and other enclosed spaces led to the development of injection foam. Unlike standard 2-part spray foam, injection foam doesn’t expand as it’s installed. Applied with a flexible hose, injection foam fills gaps and seals air leaks just like expanding spray foam. But it won’t damage sheathing or wallboard with expansion pressure. Because injection foam is water-soluble and won’t outgas harmful emissions, it’s very safe to apply. Workers don’t need to wear respirators and protective clothing like they do when installing standard 2-part spray foam. 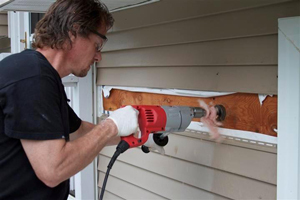 The application process for insulating exterior walls typically involves temporarily removing a row or section of exterior siding so that a small access hole can be drilled in each stud cavity. Then the injection foam is sprayed into the cavity until the cavity is filled. This insulation upgrade is effective for walls that don’t have insulation as well as for walls that have underperforming fiberglass batt insulation. The injection foam flows around existing batts as well as electrical outlet boxes, sealing all the gaps and filling all the voids found in most walls. Injection foam puts an end to energy-wasting air leaks and inadequate wall insulation. We proudly offer insulation in Bridgeport, Hartford, New Haven, and nearby areas such as Danbury, Norwalk, Stamford, Waterbury, New Britain, Bristol, West Hartford. Call 1-888-370-6924 or contact us online to schedule a Free Estimate.